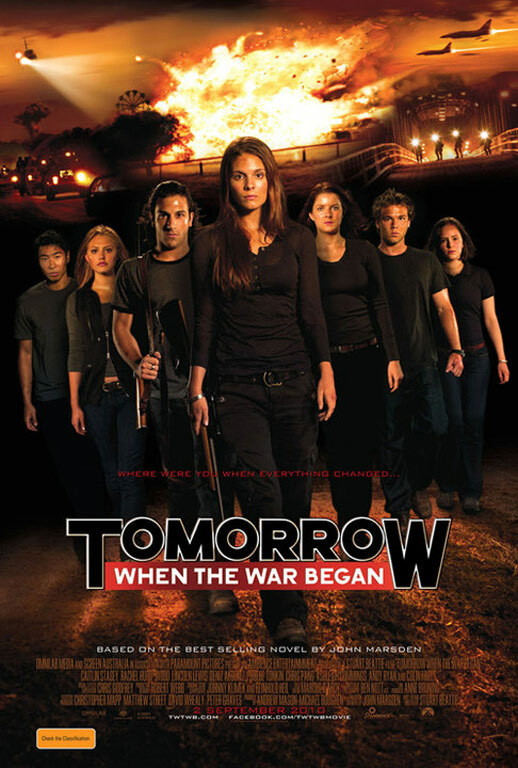 Tomorrow When The War Began is an iconic piece of Australian literature renowned not so much for its story, characters or fantastic writing as for annoying the heck out of high school students. John Marsden wrote it specifically for the high school market, aiming it at schools in need of an easy read for young adolescents. This ambit was successful, and as a result it is one of the most read stories in Australia, despite being dull, poorly-written and full of implausible circumstances and pointless guff. Needless to say, I didn’t expect much from the film. From inauspicious beginnings, apparently, great stories are born. The very act of adapting a story for film has a way of weeding out page-filling nonsense and implausible circumstances. A novel can get away with not mentioning visual elements, but scenarios undergo more thorough analysis in film. In the case of Tomorrow When The War Began, this process has thoroughly redeemed an otherwise unremarkable story. The cast, who, with one exception, are far too old to be playing characters who need to ask their parents’ permission for anything, are otherwise superb. Led by the magnificent Caitlin Stasey in the role of Ellie, they personify Marsden’s characters better than Marsden did, and without any exception they sustain impeccable performances throughout the film. And yes, I even include a former Home and Away actor in this praise, which is remarkable in itself. Like the age of the actors, the locations chosen for the film leave something to be desired, but are nonetheless redeemed. The Blue Mountains, instantly recognisable and distinctive, simply doesn’t cut it for a random bush hideaway near the fictional rural town of Wirrawee. The sandstone cliffs of the Megalong Valley are simply too familiar, and the familiarity detracts from the value of setting the story in a fictitious Australian town. The film nonetheless survives these faults, and is certainly the best saleable film made in this country for many years. The plot, characters and actors combine to produce a film that is far better in all respects than the novel that spawned it, making the tongue-in-cheek line from the film that all books are better than their films deliciously ironic. This film may not win huge numbers of awards, but thoughts that it may be the beginning of the most profitable film series in Australian history could be right on the money. I certainly hope so.